We hope you will bring the whole family to St. Joseph, MI and make a full weekend enjoying a Big Bird Charter fishing trip and taking in other great activities while you're here! We've been having fun in St. Joe for 34 years (ain't life grand?!) and we're happy to offer up some suggestions. There's a lot of great activities going on in the month of June 2017. In fact, there are so many we encourage you to check out a full list of activities in St. Joe on our local visitors bureau's website. Here's a link for a full list but some of our favorites are below! St. Joe Farmers Market - June 10, 17 & 24th Saturday morning at the Market includes succulent fruits and vegetables, jams, honey, hearth-baked breads and fine pastries, perennials, cut flowers, organic vegetables and so much more! Take the time to chat with vendors who will share recipes, planting recommendations and cooking tips. You don't want to miss out on some of the freshest local foods available in the area. The number of vendors and products offered continues to grow! Summertime Blues Weekend - June 10th & 11th Our friends at the Round Barn Winery are hosting a jammin weekend that promises to be a great time! Experience the high-energy act of JR Clark and the Allstar Blues Mob at 1pm. At 4pm Duke Tumato, a founding member of REO Speedwagon, takes the stage and is sure to bring the house down with his eclectic styles. You don't want to miss the tenacious act of Marty "Big Dog" Mercer on Sunday at 1pm. Big Dog's set will be followed by the smooth jams of the Corey Dennison band at 4pm. They are a 2017 Blues Music Award nominee by the Blues Foundation and represent some of the finest Chicago Blues bands you will have heard. Alex's Duck Duck Run - June 17th This 5k run/walk benefits childhood cancer research. There is also a 1k Fun Run for kids. Where to meet: The 5k Run/Walk & 1k Kids' Fun Run will start and end at Margaret Upton Arboretum on Water Street (along the St. Joseph River) in St. Joseph, Michigan on Saturday, June 17, 2017. The Kids' Fun Run begins at 9:20am and the 5k Run/Walk begins at 10am. 5k Run/Walk Course: This course will take runners and walkers along the beautiful St. Joseph River and two Lake Michigan beaches. Participants will race along Silver Beach, Lions Park Beach, the Howard Recreational Trail and then through the Whirlpool Compass Fountain. Runners will be chip timed using the Bib Tag System. 1k Kids' Fun Run Course: The non-competitive run (0.62 miles) is for ages 10 years and younger. It starts prior to the 5k. With volunteers cheering along the way, the children will follow a safe route along a paved sidewalk. Parents are encouraged to run with younger children. All participants receive a race bib, award and t-shirt. After the race the kids can enjoy face painting, balloon animals, carnival games, inflatable slides and music! Pre registration is recommended. For more details, please visit the events page at St. Joe Today. Sculpture Walking Tour - June 29th This event is put on by the Krasl Art Center. Sculpture Walking Tours feature public sculptures created by world-renowned and local practicing artists including Richard Hunt, Tuck Langland & Suzanne Horwitz. Volunteer docents provide information and facilitate dialogue about sculptures from the Krasl Art Center permanent collection and the Biennial Sculpture Invitational. All tours meet at the Whitcomb Tower, 509 Ship Street, St. Joseph $5 suggested donation. We hope you will bring the whole family to St. Joseph, MI and make a full weekend enjoying a Big Bird Charter fishing trip and taking in other great activities while you're here! We've been having fun in St. Joe for 34 years (ain't life grand?!) and we're happy to offer up some suggestions. There's a lot of great activities going on in the month of May 2017. In fact, there are so many we encourage you to check out a full list of activities in St. Joe on our local visitors bureau's website. Here's a link for a full list but some of our favorites are below! 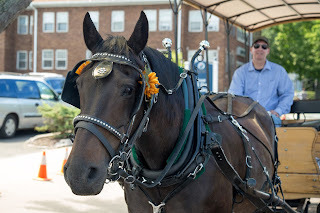 Free Horse-drawn Trolley Rides Most people aren't aware St. Joe offers free horse-drawn trolley rides through downtown. Many more aren't aware these great rides are FREE!! This can be a great way to kick up your feet after a long walk, can be a nice romantic surprise with your partner or can just be plain old fun for the whole family. You can typically catch a trolley between the hours of 12-3pm during the season but we recommend you check the complete schedule here if you're making plans around it. Courtesy of St. Joseph Today BBQ, Blues & Bluegrass: A Taste of Michigan We're super excited for the upcoming 5th annual BBQ, Blues & Bluegrass. Seriously, who doesn't love those three things?! This event takes place on Saturday, May 20th, 2017 kicking off at noon and running until 8pm. Located in beautiful Whirlpool Centennial Park, come take in the scenery, live tunes, craft beer, wine & delicious BBQ. There are 5 bands scheduled with the headliner, Johnny Lang, taking the stage at 6:45pm. You can view the lineup schedule and participating vendor list here. Tickets are $20 in advance and $25 the day of. Kids under the age of 8 are free - get your advanced tickets here. 5th Annual BBQ, Blues and Bluegrass: A Taste of Michigan Memorial Day Parade Come enjoy this parade and show your support for our veterans and active duty military serving this great nation of ours. The parade kicks off on Friday, May 26th, 2017 at noon. Beginning at the intersection of Lake Blvd. and Park St., then travels down Lake Blvd. to the John E. N. Howard Bandshell. A short program at the bandshell will be held after the parade. Veterans wishing to walk or ride in the parade please call the St. Joe Today office at 269-985-1111. Lemon Creek Winery's Art & Wine Festival Lemon Creek has been making 100% estate grown & bottled wine for over 33 years. Let's face, wine making is an art of it's own but this festival has many other art exhibits of mediums including hand crafted stained glass, jewelry, pottery, photography and fine art paintings. There is live music and food available, as well. For more info please click here. For those that have never seen all the great things that Southwest Michigan has to offer, stay tuned for our monthly highlighted events in beautiful Saint Joseph. Big Bird Charters, a salmon and trout fishing charter on Lake Michigan is a great and memorable experience which pairs well with a variety of events going on in St. Joe. From family trips to a friends getaway, there's plenty of fun for everyone! With 2017 behind us, the 2018 fishing season cannot come quick enough. We had a great time fishing and getting to know our new clientele, as well as knocking back another year with our "regulars" and adding to the memories. We look forward to seeing all of you again and extend our appreciation and gratitude for selecting Big Bird Charters as your fishing adventure. We would love to receive any pictures that you all may have from past fishing seasons as it's hard for us to capture all the action while working the back deck. For a breakdown of the general fishing season to help with planning a future trip check out our Excursions page. Thank you to all that were a part of our 2017 season and we look forward to earning your business and camaraderie in 2017! 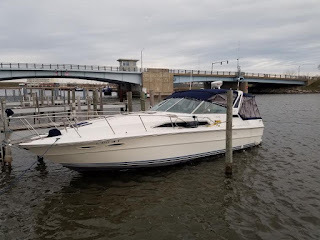 Thank you for checking out our website www.bigbirdcharters.com. Drop us a line and let us know what you think! Become a fan on www.facebook.com/bigbirdcharters and follow the "action". We would love to hear your feedback and any “likes” and “shares” are greatly appreciated. Wishing a bountiful cooler of fish to all. Let’s make 2018 a good one! While fishing can be mysteriously unpredictable at times, our guests have reeled in some quality fish resulting in mouth-watering tastiness on the grill! The Spring Coho Salmon and King Salmon flurry didn’t last as long as previous years, but the catch rates were great! From the beginning of May to the first week of June we had an overall range of 8-20 fish per trip. When the Coho are feeding like crazy, they make up the big numbers in quantity. When the spring Kings set in they provide the brute quality of the catch. Typically we start off the season fishing shallow water, but not the case this time around. We found ourselves fishing in 180 to 300 foot of water. We targeted fish in the top 40 foot as well as 150 foot down in the water column. From June to July the fishing required deeper water fishing as well. Some days we were fishing as far out as 300 foot of water. Although the fishing had its inconsistencies from day to day, we tapped into the Kings, Coho and Steelhead. Lake Trout were more prevelant from mid-June through the end of our fishing season. From July through September, the bigger adult King Salmon have started to trickle in. Along with the Kings(also called Chinook Salmon), bigger Steelhead and Lake Trout are striking our lines with the summer feeding. Lake Trout are always more prevalent in the middle summer months and there are some “hogs” out there ranging from 8-20 pounds. Our highly revered Steelhead, also known as a hybrid of Rainbow Trout made their first run into shallower waters and into the river at the beginning of July. There were also a few King Salmon mixed in. We had a hard blowing East wind which "flipped" the lake and brought cold water near our shore line. Generally speaking, these fish prefer water temps ranging from 44 to 54 degree water. Cold water plus bait fish usually equals great fishing. Pier head fishing can be a bit chaotic with all of the other boats, but it is quite thrilling! They are still out there and we are still hooking up with these unpredictable, sky-rocketing, line peeling fish! The season is not over yet and we expect to see even bigger King Salmon as they are always feeding and growing bigger. Steelhead and Lake Trout also await our tasty bait to strike upon. We love our fishing and we love our clients. We do our very best to provide an unforgettable experience and develop a personal relationship with everyone that steps aboard Big Bird Fishing Charters. Thanks to our regulars, thanks to our first-timers, and thanks to our future guests! As of 2013,we introduce the second generation, son of "Big Bird", Eric Conder "Little Bird". Eric has been fishing with Big Bird Charters since childhood, obtained his Captains License and is now back in full swing with the family business. To learn more check out our About Us page. At Big Bird Charters, we are constantly looking for ways to enhance our clientele experience. We would love to hear from you, our customers, and any recommendations you may have.